HomeNEWS & VIEWSAdvocacy & AwarenessJoin the Movement! #Act2SaveMoms has been signed into law! December 22, 2018: This is a great day for preeclampsia and the beginning of the end of needless deaths. Late last night, President Trump signed into law the Preventing Maternal Deaths Act. We are very proud and incredibly thankful! This legislation will directly impact our fight to eliminate preeclampsia, which is a leading cause of maternal mortality and morbidity. Thank you to Congresswomen Jaime Herrera Beutler and Diana DeGette​, and Senators Heidi Heitkamp and Shelley Moore Capito who led the charge on this bipartisan legislation. Thank you to all of you who tweeted, emailed, called, wrote, and petitioned our representatives to push through this critical legislation to prevent maternal deaths in this country. 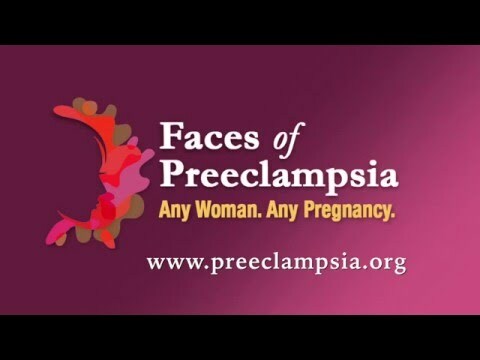 This has been a long hard road for the Preeclampsia Foundation and we have been not alone in this. We are incredibly grateful for our partners American College of Obstetricians and Gynecologists - ACOG, Society for Maternal Fetal Medicine, March of Dimes, AMCHP, and many others. We are incredibly thankful for all those who have been linked arm to arm with us for this initiative. At this time, the most important thing to know is that this fight is not over! We have a lot of work ahead of us to now fight every year to get funding appropriated to fulfill this legislation. This important bipartisan legislation is the beginning of efforts toward eradicating preventable maternal death and improving maternal and infant health in the United States. It will accelerate progress toward ensuring that every state has a high-functioning process for identifying the causes of maternal mortality and translating recommendations made by maternal mortality review committees (MMRCs) to meaningful action. The legislation will also advance efforts among states to standardize the collection and analysis of data so that we can develop a national understanding of why mothers are dying in the United States and what it will take to reverse this tragic trend. More women in the U.S. die from complications related to pregnancy than in any other developed country. To address this alarming fact, the Preeclampsia Foundation is spearheading bipartisan legislation titled the Preventing Maternal Deaths Act of 2017, H.R.1318, and the Maternal Health Accountability Act of 2017, S.1112. Introduced in the U.S. House of Representatives and the Senate, these bipartisan bills aim to help states establish or improve their maternal mortality review committees (MMRCs) – interdisciplinary groups of local experts in maternal, infant, and public health – to examine maternal death cases and identify locally-relevant ways to prevent future deaths. The Senate Health, Education, Labor, and Pensions (HELP) Committee has already unanimously approved S. 1112, and the leadership of the House Energy and Commerce Committee's Health Subcommittee expressed bipartisan support during a September 2018 hearing on H.R. 1318 for passing the bill this year. “As a driving force behind these bills,” said Eleni Tsigas, Chief Executive Officer of the Preeclampsia Foundation, “we’re asking our supporters to encourage their Representatives and Senators to bring this legislation for a vote in the House of Representatives and Senate before the end of this year." The U.S. ranks 47th globally for its maternal mortality rate, and women die every day in the U.S. due to complications from childbirth. Preeclampsia, HELLP syndrome, and related hypertensive disorders of pregnancy are a leading cause of maternal death, and for every death, there are at least 50 times more cases of adverse outcomes. Significant health disparities exist in the U.S.: black women are three to four times more likely to die from a pregnancy-related complication like preeclampsia than white women. The Preventing Maternal Deaths Act and Maternal Health Accountability Act seek to mitigate these statistics by supporting MMRCs and promoting national information-sharing through the Centers for Disease Control and Prevention (CDC) so that states can continue to learn from best practices and collaborate with each other. Now we need your help to put an end to preventable maternal deaths! Please act to save moms by doing these two things to move this legislation forward -- call and email your Representative and Senators today! Identify your Representative at www.house.gov by your address and zip code, and your Senators at www.senate.gov by state. Call their offices and ask to speak to the health legislative assistant. Tell that staffer that you would like your Representative or Senator to pass H.R.1318 and S.1112. Ask the staff members you speak with for their email address. Send them a short email (template below) following your call that is addressed to the Representative or Senator. Personalize this email to tell your story and the story of your loved ones. After you talk to the office, look up their Congressional website, find their Twitter address, and tweet the following message to their address: "@[Member of Congress Twitter Address] join @Preeclampsia & stop maternal death in the US. Pass HR1318 and S1112 #Act2SaveMoms." I am calling to ask for the Representative/Senator to pass H.R.1318/S.1112. This is a bipartisan bill that would support our state in putting an end to preventable maternal deaths. In the United States, maternal deaths during pregnancy, delivery, and in the postpartum period have been on the rise from health conditions like preeclampsia. The purpose of the legislation is to understand why maternal deaths happen in our state and support the state in identifying solutions to ensure no mother or baby ever dies from preventable circumstances. This bill is important to me because [SHARE YOUR EXPERIENCE OR THE EXPERIENCE OF SOMEONE CLOSE TO YOU]. I will send you a follow-up email. Please consider cosponsoring this important legislation. Thank you. Email addresses in the House of Representatives are firstname.lastname@mail.house.gov. Email addresses in the Senate are firstname_lastname@senatorlastname.senate.gov. March 2, 2017 — Washington DC — The American Congress of Obstetricians and Gynecologists (ACOG) and the Preeclampsia Foundation announce their endorsement of new bipartisan legislation introduced on March 2, 2017, that will allow states to address preventable maternal deaths and the devastating and costly health consequences that threaten the lives of moms and babies across the country. The statistics on maternal death are staggering. The United States ranks 47th globally for its maternal mortality rate and the maternal death rate continues to rise despite major advancements in medical technology and treatments. The Preventing Maternal Deaths Act addresses the problem by recognizing that the first step forward is to tackle this national issue at the local level by helping states set up maternal mortality review committees (MMRCs). "'Measure what is measurable, and make measurable what is not so.' This statement was made by the Renaissance scientist Galileo and remains true 450 years later. We cannot correct or establish priorities to prevent maternal mortality and morbidity unless we can identify targets by determining the magnitude of the problem. I was made abundantly aware of this when I chaired the American Congress of Obstetricians and Gynecology Task Force on Hypertensive Disorders in Pregnancy in 2013. We were fortunate to have access to a remarkable quantitative and descriptive summary of recent maternal mortality and morbidity from California. What was evident from this, which would not have been without this information, was that past efforts to have care providers carefully (and unfortunately rigidly) define the pregnancy hypertensive disorder, preeclampsia, had unintended consequences. Preeclampsia is the most serious (deadly) form of hypertension in pregnancy. It affects many organs of the body including the kidney with resulting leakage of protein into the urine. For over 100 years the presence of protein in the urine was used to separate preeclampsia from other less serious high blood pressure problems that did not mandate delivery – despite the knowledge that other organs could be affected. What the California information showed was that some care providers were rigidly demanding protein in urine in women with pregnancy hypertension and did not deliver women without this finding even if they were seriously ill with body organs other than the kidney involved. Based on this the Task Force changed the diagnosis of preeclampsia to be high blood pressure and protein in urine or evidence of other organs being involved. Lives are now being saved by this change. This problem, as well as many others, would not have been recognized without accurate determination of what leads to deaths of mothers in pregnancy – a family disaster that must be prevented." “Preeclampsia is one of the leading causes of maternal and neonatal complications. We are only beginning to understand the causes of preeclampsia, but recent studies have led to significant insight into the early pregnancy mechanisms that may be involved. When we understand the mechanisms, we can design intelligent interventions to prevent preeclampsia, which not only will improve the health of mothers and babies, it will also improve the long-term health of our population. Improving healthcare efficiency depends on major breakthroughs in research to prevent common diseases like preeclampsia." "As a physician, I lend my unconditional support to this bill which emphasizes the value of every woman's life. As a pediatrician, I advocate for not only the reduction in maternal mortality, but also the reduction in neonatal morbidity (i.e. prematurity) and mortality. I am confident that novel insights that link the etiology of preeclampsia to existing conditions with compromised renal perfusion (e.g., cardiorenal syndrome and obesity-related hypertension) are on the verge of revolutionizing prediction and prevention techniques for women vulnerable to this condition. Our collective efforts, advocacy, and resource allocation can only enhance the efficiency and effectiveness of our compassion-driven mission." "For most women, pregnancy is a time of joy and expectations fulfilled by the safe birth of a child into an expanded family. Beneath this surface of successful motherhood are dangers to a woman’s life and health paralleled by dangers to the unborn and newborn child. Some women carry identifiable risk factors into a pregnancy associated with preexisting and identifiable medical conditions. Others enter pregnancy with the appearance of health only to develop rapidly accelerating conditions such as hypertension or postpartum hemorrhage resulting in their death. Many, if not most, of these deaths are preventable. Prevention requires an understanding of the causes of women dying. Careful maternal mortality review identifies these and in doing so identifies local community, state-by-state, action points. Without maternal mortality review we do not have appropriate action points for local communities. Without community review we do not see these women and the loss they represent to their families and communities. We dishonor their loss of life and miss the opportunity to protect their sisters and daughters." "One of the biggest challenges to understanding and reducing the U.S. maternal mortality rate is the lack of comprehensive data; standardized data collection will enable identification of specific issues that challenge maternal health, and will inform strategies to reduce both maternal and neonatal mortality."